The Global Tropical Moored Buoy Array group is working with the National Weather Service (NWS) to finalize the transition of operational responsibility for the TAO array to NWS Operations. Using data from the array, PMEL researchers continue their research on ENSO events and assess their impacts on global weather patterns. 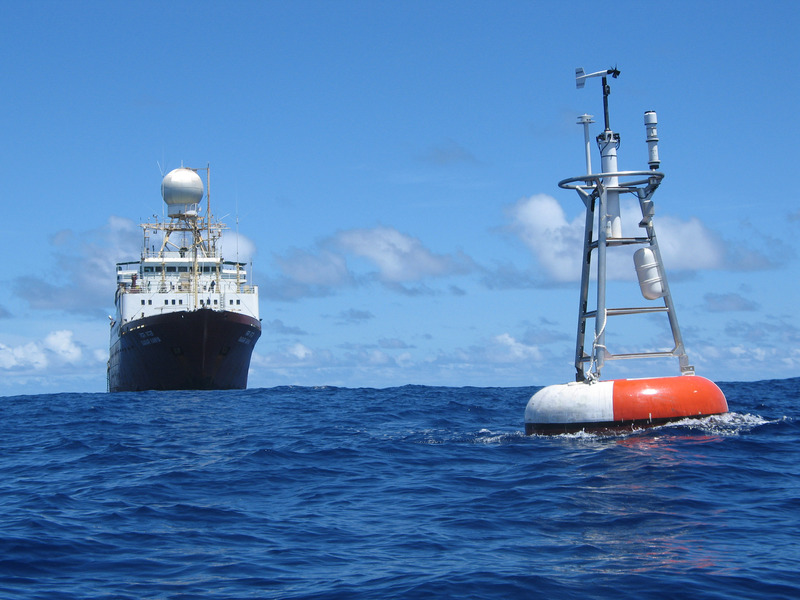 The Tropical Moored Buoy Array group maintains the Prediction and Research Moored Array in the Tropical Atlantic (PIRATA) and is developing the Research Moored Array for African-Asian-Australian Monsoon Analysis and Prediction (RAMA) networks of moored buoys in the Atlantic and Indian oceans, respectively. The PIRATA array was initiated in 1997 and is a highly successful partnership between the U.S. (NOAA/PMEL), France, and Brazil. RAMA is under development in the Indian Ocean as a joint effort between the U.S., Japan, India, Indonesia, France, China, Australia, and a consortium of East African nations that support the Agulhas and Somali Current Large Marine Ecosystems (ASCLME) Project.